For the 1995 television film, see Go Now (film). "Go Now" is a song composed by Larry Banks and Milton Bennett. It was first recorded in January 1964 by Bessie Banks, and later became associated with The Moody Blues. "It Sounds Like My Baby"
(1964) "I Can't Make It (Without You Baby)"
The song was first recorded by Larry Banks's former wife, Bessie Banks. A 1962 demo recording by Bessie of the song was heard by songwriters and record producers Jerry Leiber and Mike Stoller, who re-recorded it in late 1963, with arrangement by Gary Sherman and backing vocals from Dee Dee Warwick and Cissy Houston. The single was first released in early 1964 on their Tiger label, and later reissued on the Blue Cat label, the R&B/soul imprint of Red Bird. Her version reached No. 40 on the Cashbox R&B singles chart. I remember 1963 Kennedy was assassinated; it was announced over the radio. At the time, I was rehearsing in the office of Leiber and Stoller. We called it a day. Everyone was in tears. "Come back next week and we will be ready to record 'Go Now'"; and we did so. I was happy and excited that maybe this time I’ll make it. 'Go Now' was released in January 1964, and right away it was chosen Pick Hit of the Week on W.I.N.S. Radio. That means your record is played for seven days. Four days went by, I was so thrilled. On day five, when I heard the first line, I thought it was me, but all of a sudden, I realized it wasn’t. At the end of the song it was announced, "The Moody Blues singing 'Go Now'." I was too out-done. This was the time of the English Invasion and the end of Bessie Banks’ career, so I thought. America's DJs had stopped promoting American artists. Banks' recollections are questionable, because her single was released in the US in January 1964, and The Moody Blues' version was not released until November 1964 (in the UK) and January 1965 in the US. (1964) "I Don't Want to Go On Without You"
"Go Now!" (adding an exclamation mark) was made popular internationally later in 1964 when an English beat group from Birmingham named The Moody Blues recorded it, with Denny Laine on guitar and lead vocals. When Denny Laine first heard Bessie Banks's version, he immediately told the rest of the band that they needed to record the song. In contrast to other songs from their debut album The Magnificent Moodies, "Go Now!" contained many early elements of what later would become progressive rock, such as the lush instrumentation, the innovative variations of the Fifties Progression, as well as strong baroque elements that would later become hallmarks of progressive rock. At the time the single was released, it was being promoted on television with one of the first purpose-made promotional films in the pop era, produced and directed by their co-manager Alex Wharton (the father of DJ Sonny Wharton). The short film clip used to promote the single predates Queen's similar "Bohemian Rhapsody" video by a decade. It also predates what The Beatles did with promotional films of their singles "Rain" and "Paperback Writer", both released in 1966, although The Beatles had done promotional films in 1964 and 1965. The song reached No. 1 in the UK Singles Chart in late January 1965. In the US, "Go Now!" did not enter the Billboard Hot 100 until mid-February 1965; it peaked at No. 10. The next chart successes for The Moody Blues were "Nights in White Satin" and "Tuesday Afternoon" in 1968. The Moody Blues had little success with singles after "Go Now!" in the mid-1960s, which led to Laine's departure from the band, later being replaced by Justin Hayward. Bassist Clint Warwick had already departed the band at this time. Rodney Clark had replaced him for a while before they recruited John Lodge. With the new lineup, The Moody Blues continued to perform "Go Now!" for a short time, up until they began writing their own material. Hayward sang the song during his first year with the band, and Ray Thomas attempted to sing it a couple of times himself. Laine continued to perform the song in concert during his years in Wings. On June 21–23, 1976, at The Forum in Inglewood, CA, Laine performed "Go Now!" with the band Wings, accompanying himself on piano, along with Paul McCartney on bass and vocals, Linda McCartney on vocals, Jimmy McCulloch on lead guitar, and Joe English on drums. This version of "Go Now" appears on the Wings Over America live album. He also sang the song at the Birmingham Heart Beat Charity Concert 1986 raising money for the local children's hospital. In January 1997, "Go Now" (without an exclamation mark) was released on The Very Best of the Moody Blues; its release on this album was the first time it had been released on a Moody Blues compilation album. "Go Now" was also released on the subsequent Moody Blues two-disc compilation album Anthology. Laine later covered "Go Now" in 2007 on his album Performs the Hits of Wings. "Go Now!" was performed by Denny Laine with The Fab Faux on December 11, 2010, at Terminal 5 in New York City and February 26, 2011 at the State Theatre in Easton, Pennsylvania. Paul McCartney and Wings (lead vocal Denny Laine) on their 1975-1976 Wings Over the World tour and on their Wings Over America triple album released December 1976. The song is also in the musical Return to the Forbidden Planet. 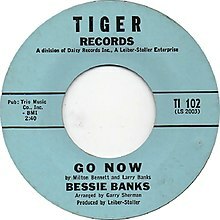 The original Bessie Banks version of "Go Now" was included on the soundtrack to the film Stonewall. The Moody Blues version is played over the credits after the final anniversary dance scene with Charlotte Rampling and Tom Courtney in the film 45 Years. The version by The Moody Blues was used on the satirical British television show Spitting Image in a scene concerning then Prime Minister Margaret Thatcher. ^ Patience, Stephen. "Go Now : Bessie Banks (1964)". ^ "Bessie Banks: The Original "Go Now" Girl (1959-1976)". Northernsoultrain.co.uk. ^ a b "SoundClick artist: Larry and Jaibi - Classic Soul/R&B, from my parents, Larry Banks and Jaibi(Joan) C. Banks". Soundclick.com. 1992-02-26. Retrieved 2014-04-05. ^ Warner, Jay (30 April 2007). American Singing Groups: A History from 1940 to Today. Hal Leonard Corporation. p. 204. ISBN 978-0634099786. ^ Whitburn, Joel (2004). Top R&B/Hip-Hop Singles: 1942-2004. Record Research. p. 45. ^ Roberts, David (2006). British Hit Singles & Albums (19th ed.). London: Guinness World Records Limited. p. 174. ISBN 1-904994-10-5. ^ "The Moody Blues Album & Song Chart History". Billboard.com. Retrieved 2014-04-05. ^ "Moody Blues | The Very Best of The Moody Blues". Moodybluestoday.com (Official Fan Site). Archived from the original on 2011-07-19. ^ "Moody Blues | Anthology". Moodybluestoday.com (Official Fan Site). Archived from the original on 2011-07-19. ^ "Performs the Hits of Wings". Allmusic. Retrieved 28 December 2011. ^ "Top RPM Singles: Issue 5672." RPM. Library and Archives Canada. ^ "The Irish Charts – Search Results – Go Now". Irish Singles Chart. ^ "Dutchcharts.nl – The Moody Blues – Go Now!" (in Dutch). Single Top 100. ^ "Moody Blues: Artist Chart History". Official Charts Company. ^ "The Moody Blues Chart History (Hot 100)". Billboard. ^ Walters, Ben (2011-02-10). "How will Meryl Streep's Margaret Thatcher compare to past portrayals of the Iron Lady? | Film". theguardian.com. Retrieved 2014-04-05. This page was last edited on 27 March 2019, at 01:20 (UTC).